The Gard is the most easterly department in Languedoc-Roussillon and comprises the major towns of Nîmes, Uzes, Ales, Remoulins and Bagnols-sur-Ceze. Like most departments, it is named after the river that flows through it. Despite being a mainly inland area, the Gard has 18km of sandy coastline on its southern tip. The department is renowned for its soaring summits and fertile valleys cut through by innumerable rivers and streams. The land is very productive in the Gard, which is quite distinctly subdivided into three geographical regions. The north-west is predominantly comprised of the mountain range of the Cevennes, which reaches a height of 5120 feet. The centre of the department is called the Garrigues. This area is mainly characterised by limestone hills that support the cultivation of vines and olive trees. The southern portion stretches from the centre to the sea. The landscape reveals that at one point this whole area would have been under water. All that is left now, however, is a vast number of lakes and marshes. The land here is considered the most fertile in the Gard. The south of the department is a little warmer than the inland areas. The Gard played a key role in the rise of the Protestant movement in the Middle Ages. The perceived corruption of the wealthy clergy at a time when poverty reigned led many to break away from the church and join the Cathars. The Romans came to the region almost 2000 years ago, attracted by the warm climate and fertile soil. They founded Nîmes as one of their largest Roman outposts. Today it is the capital of the Gard and is perhaps better known for its jeans industry. The word 'denim' comes from the French, 'de Nîmes', which literally means 'from Nîmes'. The Romans have certainly left their mark on the Gard. Nîmes is an excellent place to go to view wonderfully preserved Roman buildings and the Pont du Gard is the department's most prized possession. This is an incredible feat of construction on the banks of the Gardon Gorge. At 48m, it's the largest aquaduct the Romans ever built. 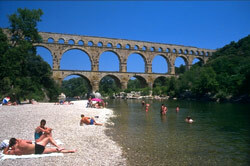 It was designed to transport water from the springs near Uzes to the people of Nîmes. There is an airport ten kilometres from Nîmes in the small town of Garons, that has regular Ryanair flights from the UK. (Currently from Liverpool, London Luton and Birmingham.) Otherwise there is Montpellier airport (easyJet and Ryanair), just over the border in the Hérault and Avignon airport (Flybe) in Vaucluse, which also have direct flights to/from the UK. If you'd prefer to travel by train, the TGV service runs from Calais to Paris and from Paris to Nîmes. The Gard is a popular department and prices are relatively high. The larger cities, such as Nîmes, are expensive places in which to live. Along the coast, price tags for renovation properties generally start at around €200,000. Do you know Gard better than we do? Do you have photos of Gard? 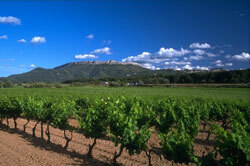 The Gard is located in the east of the Languedoc-Roussillon region of southern France.